A body of liquid water beneath the polar Martian glaciers has been detected using radio waves, scientists reported in Science on Wednesday. The lake seems to lie about 1.5 kilometers (nearly 1 mile) below the surface of the polar ice. The announcement is based on painstaking radio-wave mapping of the ice caps, done from 2012 to 2015. The endeavor produced signals very much like the radar profile of water beneath the Antarctic and Greenland ice sheets on Earth. Mars is colder than Earth, being farther from the sun. Because of its thin atmosphere, it doesn’t retain heat well. In winter, the temperature at the poles can drop to -125 degrees Celsius (-193 degrees Fahrenheit). And unlike our poles, where the ice consists of water, the Martian polar caps are cold enough to have frozen carbon dioxide as well. But salt lowers the temperature at which water freezes and the newly found subglacial lake, if there is one, could remain liquid if the water is briny, as well as due to pressure from the glaciers above it. We know Martian rocks contain magnesium, calcium and sodium, which could have dissolved into the water, At this stage, though, the scientists aren’t laying bets on the concentration of minerals in the putative Martian lake. The discovery of the Martian lake – using a device called the Mars Advanced Radar for Subsurface and Ionosphere Sounding – is all the more intriguing following the 1999 discovery of life not only surviving but thriving in extraordinarily inhospitable conditions here on Earth. Never mind starfish by volcanic vents in the deep ocean: bacteria have been found in the Antarctic subterranean lake Vostok, which lies beneath 4 kilometers of glacial ice and has been isolated for millions of years. And several species of nematode worms were found frolicking 2 kilometers below the surface in a South African mine; the worms were eating bacteria that also lived in the earth’s bowels. In 2017, cores taken from a mud volcano right by the Mariana Trench were found to contain biological signatures. This proves nothing, but the inference is that bacteria could live in mud as deep as 10 kilometers beneath the sea floor. By the way, it’s really hot down there. Back on freezing Mars, if the scientists are right, it will be the first time liquid water has been discovered on the neighboring planet – though scientists have suspected the existence of it since the 1980s. More recently, it has been postulated that marks on the surface – notably what looks like water erosion down slopes – were created by flowing liquid, possibly caused by summer heat melting subsurface ice. The solar system as we know it began to form from a nebula of gas and dust about 4.6 billion years ago. Exact mechanisms of star and planetary creation are still argued about, but it is believed Earth and Mars basically formed from rubble left over from the Sun’s own birth, which continued to orbit the nascent star. Scientists suspect that billions of years ago, our neighboring planet had liquid water and an atmosphere. Enabled by the warming of intense volcanism, as much as a third of Mars may even have been covered by ocean. It is then, when conditions were hospitable, that Mars may have had some form of life, if it ever did, scientists suspect. 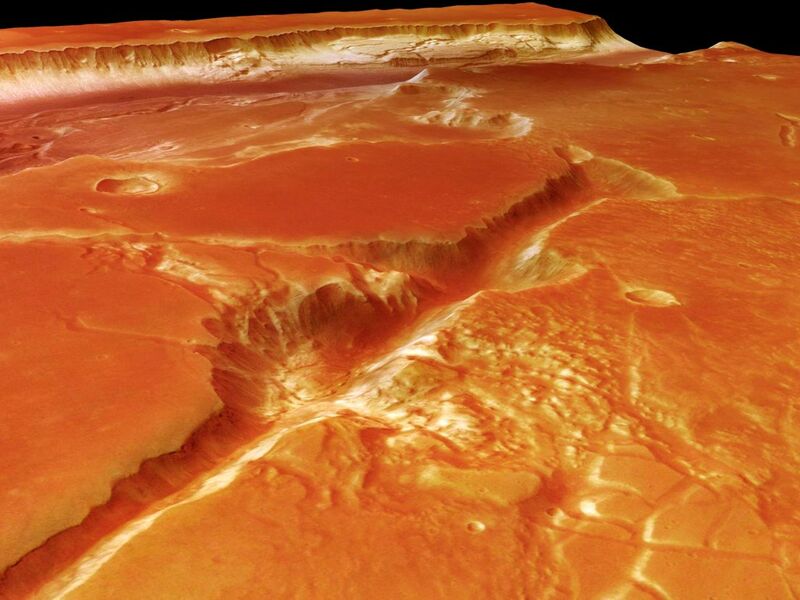 The seas may possibly have been shallow, but it begs the question of how Mars lost its water – or if it did. A recent theory from Oxford suggests that the water didn’t get blown into outer space together with most of the atmosphere but, over eons, sank below the surface and became adsorbed into Mars’ rocks. 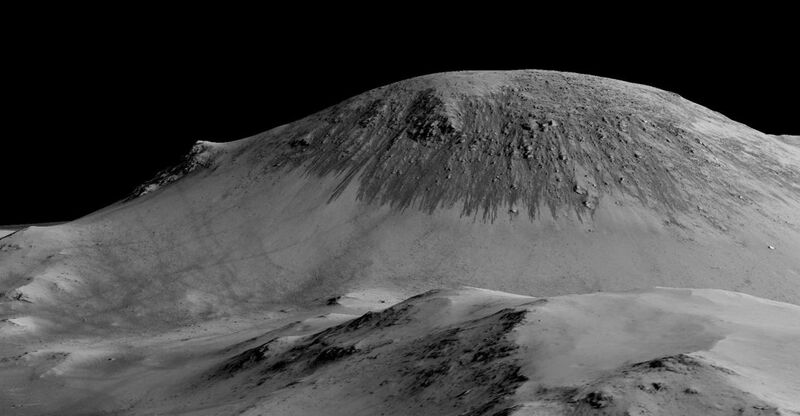 The existence of water ice on Mars’ poles had long been proved: NASA even managed to sample it physically in 2008. 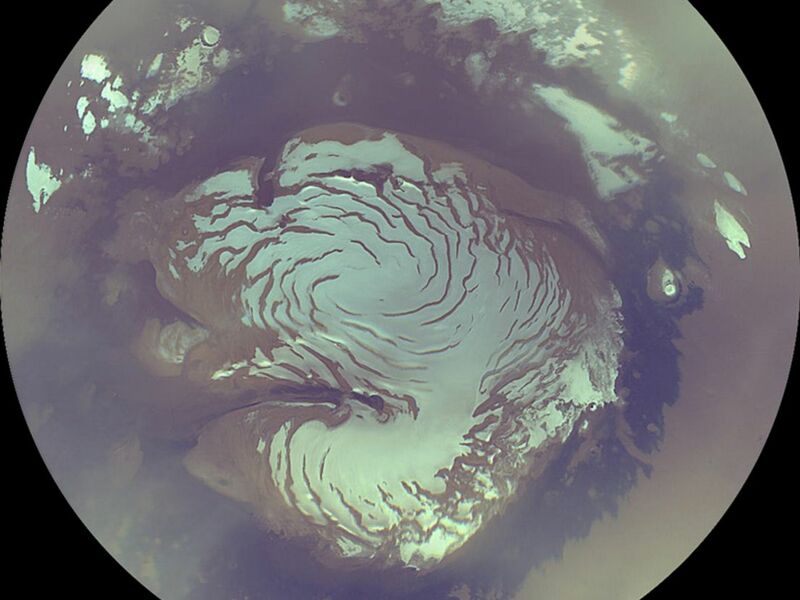 It discovered that H2O is H2O is H2O, but ice on Mars isn’t like ice on earth exactly. The Martian ice was so hard that it could not be sampled by scoop. The Lander had to resort to a rasp on the back of its scoop to loosen samples that the scoop then collected. 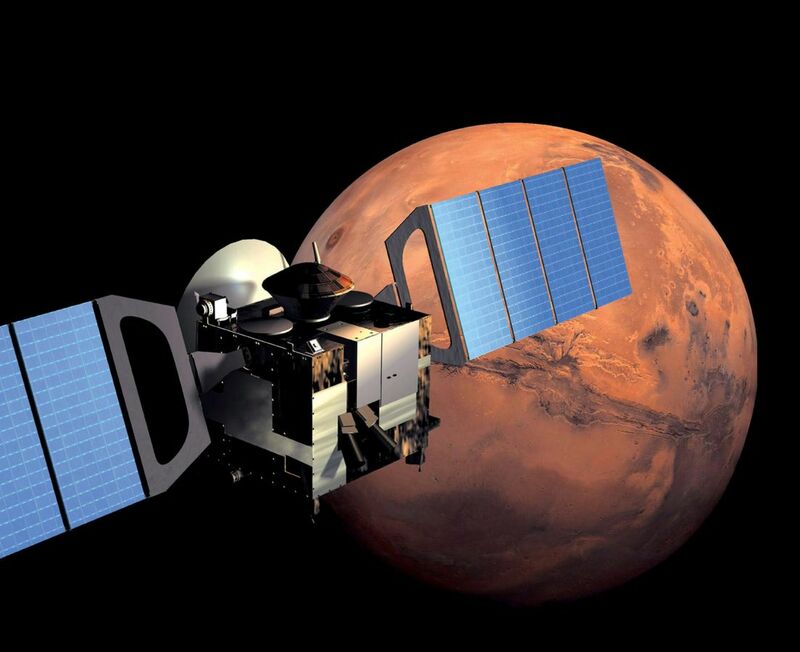 They then discovered that while ice on Earth tends to melt, it tends to vaporize in the thin Martian atmosphere. This January, NASA joyfully reported that its Mars Reconnaissance Orbiter had found eight sites far below the poles where thick layers of subsurface ice peeped bluely from eroded cliffs. These sites were at the middle latitudes of the planet. Some geologists postulate that these ice sheets could be remnants of glaciers millions or billions of years old. In any case, this ice might well melt in the Martian summer, when midday temperatures can reach a staggering 20 degrees Celsius – as high as a summer day in Stockholm or a winter day in Tel Aviv. Even though Mars is right next door, we have not visited it physically as we have the moon, though we study it obsessively. Just this week, Johns Hopkins University reported the chemistry-driven revelation that the red dust famously covering the planet’s surface mostly originated in one place, albeit a big one – a 1,000-kilometer stretch near its equator. Knowing where the dust came from is nice, but not terribly crucial to our daily lives. The million dollar question is whether there’s life in that lake, and what it might “mean.” We do not know at this point. Theories of panspermia are not based on finding actual microscopic life-forms from outer space. Organic molecules discovered on Mars or meteors did not necessarily, or even probably, arise from life-forms. Chemists have proven that organic molecules – including some quite complex ones – can arise from purely geological processes, without need for enzymes. When in doubt, adopt the principle of Occam’s razor and choose the simplest explanation – which means, choose simple geology over complex biological processes with or without a divine spark. Science has proven that life can exist on Earth under extraordinarily onerous conditions. That doesn’t mean it exists anywhere else, under any conditions. We as a people enjoy postulating about life on the Jovian moon of Europa, which is believed to have a 100-kilometer deep subsurface ocean. Granted, it is extremely far from the sun and has no atmosphere to retain heat. But the Europan ocean is kept liquid by the sheer violence of Jupiter’s gravitational pull. The fact is, so far there is zero proof of life beyond Earth. However, as physicists have pointed out, if alien life exists in some other dimension, or is comprised of dark matter or energy that we can’t even detect, let alone see, they might be right among us and we wouldn’t know.